Company — True-Surface® by Turfline, Inc.
True-Surface's® story is one of pure American will and opportunity. While working for a local Toro distributor, John Humphrey, CEO, realized golf course greens rolling is a logical agronomic practice that he could sell. In 1984 Humphrey went out on his own under the name of Turfline, Inc., as a turf distributor working out of his home while developing the idea for the world’s first vibratory greens roller that would attach directly to a triplex greens mower. His hard work soon paid off, and he was awarded the patent for the True-Surface® Vibratory Greens Rollers in 1992. That same year True-Surface® was used in preparation for the PGA tournament held at Bellerive Country Club in St. Louis, Missouri. We keep it real at True Surface. When you call during regular business hours, you will always talk to a real, live person – never a machine! Because our office and factory facility are within walking distance of each other, communication is constant. Office personnel are trained to know all the True-Surface® products and even spend a few days during initial training at the factory to learn how each product is assembled. We believe the more our entire staff understands the products, the better we can serve you. Click here to contact our staff. We offer real quality products. All True-Surface® products are manufactured in Moscow Mills, Missouri at the Turfline factory where a qualified technician builds each product, and thoroughly inspect each item before it leaves our facility. We guarantee you will receive a quality product every time you order. We practice what we preach. Technical answers on the spot, same day shipments direct to your course and a 2-year warranty on all our wholegoods. True-Surface® by Turfline is made up of real people who treat you as we would want to be treated. We are flexible when we need to be and will go the extra mile to take care of your needs. You can contact us with confidence knowing your call with be handled with care and will not fall through the cracks. John is the founder of Turfline, Inc., and the inventor of the patented True-Surface® Vibratory Greens Rolling System. He is the president of the company and head of the sales department. John received his turf training while working for a local Toro distributor in St. Louis, where his background evolved from agriculture in pesticides to a turf background in equipment and pesticides. As head of the accounting department and office manager, Linda is responsible for making sure all day to day tasks run smoothly in the office. She assumes responsibility as Turfline’s human resources officer and is in charge of the company taxes, insurance and payroll. Terry, known to most people as “Red,” is our international salesman. You’ll find him traveling around the world to establish international distribution and visiting golf courses worldwide. Terry manages all the international accounts as well as the domestic distributors. Cassie is the sales manager for all domestic accounts. She helps coordinate sales incentive programs for all our distributors and offers both domestic and international sales support to the True-Surface® by Turfline’s salesmen, distributors, and golf courses. Additionally, Cassie arranges all international and domestic shipments leaving the manufacturing plant. With 13 years of experience, she has also assumed the accounts receivable, front line, and data entry positions. Christopher is the marketing director for all True-Surface® products. He has the task of organizing all show materials and coordinating with our sales team to ensure a quality trade show. 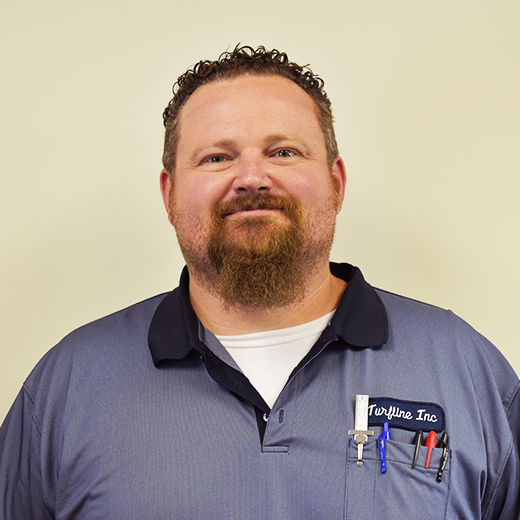 Christopher began his work at Turfline assembling our products while he was still in school. This experience allows him to help with any technical questions as well as help take customer calls and parts orders. Christopher also has the task of maintaining Turfline’s webpage and the Facebook page. As production manager, Brad oversees the manufacturing and machining of True-Surface® products. He ensures all products are fit for the field before shipping out of the factory. Randy is a Turfline veteran. Besides John Humphrey, Randy has been employed the longest and knows all the True-Surface® products better than most. 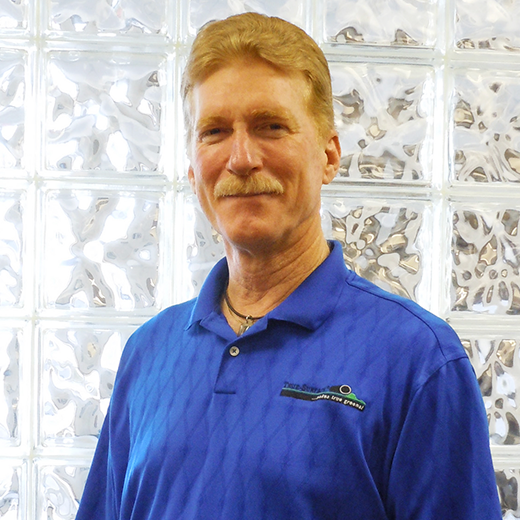 Randy is a professionally trained technician in engineering and design technology. He will answer any technical questions and try to help find a solution to any possible technical issue. Randy is also assisting in keeping Turfline running efficiently by performing all of the facility and machine maintenance! 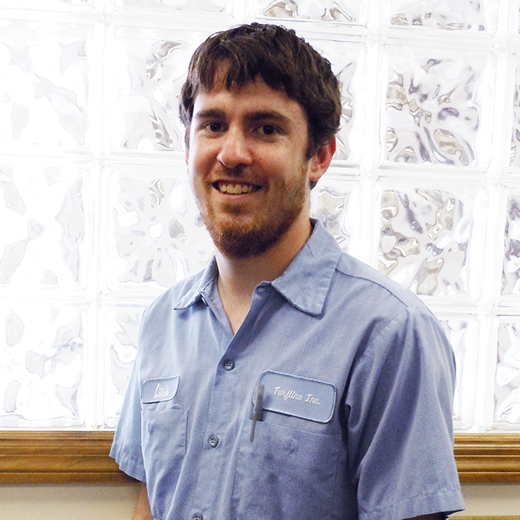 Ryan is a professionally trained technician in engineering and design technology. Ryan obtained his B.S. in Mechanical Engineering from Missouri University of Science and Technology. Ryan is the head of the Research and Development department and is brainstorming ways to improve True-Surface® products even more. Ryan also helps assist in finding solutions to technical issues. Natalie keeps the company up and running by making sure all our bills are paid accurately and on time! And when she’s not busy paying the bills or balancing checkbooks, Natalie is keeping an eye out on our inventory levels. She also is in charge of assigning part numbers to all True-Surface® parts and whole goods. Bobby plays an important role in the production of all True-Surface® parts and whole goods. He programs and runs the high-tech machines that manufacture each part. Bobby is also trained to check all True-Surface® machined parts for quality assurance. Joe plays an important role in the production of all True-Surface® parts and whole goods. He programs and runs the high-tech machines that manufacture each part. Joe is also trained to check all True-Surface® machined parts for quality assurance. Branden is professionally trained to assemble all True-Surface® products, but specializes in assembling the True-Surface® Vibe V™. Not only does he build the Vibe V™ Vibratory Greens Rollers, he also assists in prepping each one for shipment. He will answer all of your technical questions regarding the vibratory greens rollers. The workshop is where our products are built from the ground up. Our excellent team works tirelessly to ensure the best quality for each of our products. Like our company, the building is small in size but big in delivery. The office is home base and where True-Surface® is run. We have offices for our employees, rooms for meetings, and also spaces for relaxation. It may be a stark difference when compared to the workshop, but the work ethic is just as admirable.